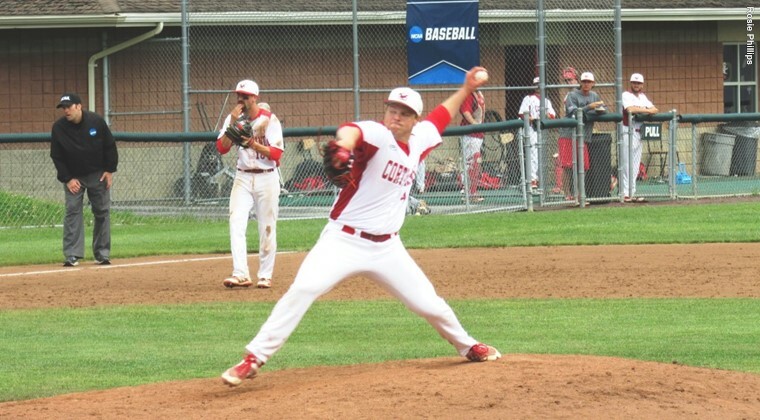 Sunday, May 20, 2018; Falcon Park; Auburn, N.Y.
AUBURN, N.Y. — Cortland’s bid for a fourth NCAA Division III World Series appearance in the past five seasons came up short as the nationally ninth-ranked Red Dragons lost to Southern Maine, 12-10 in 10 innings, in the NCAA New York Regional at Falcon Park. Cortland defeated Baldwin Wallace, 10-9 in 11 innings, earlier in the afternoon to advance to the match up with the Huskies. Cortland closes the season 35-12 and finishes tied for 17th nationally in the NCAA tournament. The Red Dragons were making their 26th consecutive NCAA appearance- the longest active streak nationally in Division III. Swarthmore (37-9) defeated Southern Maine (30-15), 9-3, in the championship round late Sunday night to win the regional title and earn a World Series berth. Two Cortland players – junior second baseman Marcos Perivolaris (Mattituck) and junior pitcher Matt Valin (LaFargeville) – were named to the all-tournament team. Perivolaris batted .455 (10-for-22) with a homer, triple, two doubles, seven RBI and five runs scored in five games and handled 18 fielding chances without an error. Valin allowed five hits and one run and struck out 12 batters in seven innings in Cortland’s win over Baldwin Wallace. Swarthmore’s Charles Levitt was named the regional’s Most Valuable Player and was joined on the all-tournament team by teammates Jackson Roberts, Ricky Conti and A.J. Liu, Southern Maine’s Zach Quintal and Andrew Olszak, Salisbury’s Connor Reeves, Baldwin Wallace’s Phil Wells, St. Joseph’s of Long Island’s Joseph Murphy, and Cortland’s Perivolaris and Valin. Ralph Nuzzi (Mount Kisco/Fox Lane) hit a walk-off RBI single up the middle in the bottom of the 11th inning after Baldwin-Wallace rallied from an eight-run deficit over the final two regulation innings. With Cortland leading 9-1 after seven innings, the Yellow Jackets scored six runs in the eighth, highlighted by Alex Ludwick’s two-out, three-run triple. With two outs in the ninth, Dudley Taw conquered an 11-pitch at-bat and hit a double in front of the diving Antonio Pragana (Hopewell Junction/John Jay) in center that scored a pair and sent the contest to extra innings. Colin BeVard (Syracuse/West Genesee) led off the 11th inning with a walk before advancing to second when Matthew Personius (Binghamton/Chenango Valley) grounded out on a hit-and-run play. Nuzzi, who pinch ran for Patrick Schetter (Beacon) in the seventh, lined a full-count pitch through the middle for the game winner. Valin took a no-decision for Cortland despite allowing one run through seven innings with a career-high 12 strikeouts. He allowed five hits and six walks in his first start of the season. Isiah Hudson (Hyde Park/FDR) entered in the ninth, in a save situation, but surrendered the game-tying run after a border-line pitch on a 0-2 count to Taw was ruled a ball. After allowing a single to begin the 10th, Hudson retired the final six batters he faced in order and earned his seventh win of the year. BeVard was 2-for-5 with two RBI and two runs, while Joe Tardif (Cutchogue/Mattituck) and Paul Dondero (East Islip) were each 2-for-5 with a run. Perivolaris also went 2-for-5 with an RBI and a run scored. Matt Michalski (Buffalo/St. Francis) finished 2-for-4 with a walk and a run. For the Baldwin Wallace (33-14), Taw went 2-for-5 with a walk, a run scored, and a game-high four RBI. Phil Wells finished 3-for-3 with two walks and a run. Michael Hubert allowed a run on three hits with two strikeouts and two walks over three and two thirds innings of relief, but was credited with the loss after walking BeVard before being removed in the 11th. Quintal hit a two-out, two-run triple in the top of the 10th inning to complete Southern Maine’s comeback. The Huskies scored five runs in the seventh to tie the game at 8-8, and tallied twice in the top of the ninth to knot the game again at 10-10. Southern Maine scored three in the top of the first on an Olszak RBI triple, an error, and a Devin Warren RBI double. Cortland, however, scored four in the bottom of the first on a Personius RBI single, a Schetter sac fly, a Perivolaris RBI double, and a throwing error on a bunt by Justin Teague (North Syracuse/Cicero-North Syracuse). Cortland added a run in the third on Dondero’s squeeze bunt and three in the fourth on a Perivolaris RBI triple, a Teague RBI infield single and, two batters later, a Michalski RBI single. Southern Maine took advantage of a two-out error that kept the inning alive and scored five times in the seventh. Kyle Heath and Anthony Degifico each singled in a run, Sam Troiano hit a two-run triple, and Quintal followed with an RBI single. Cortland regained the lead in the bottom of the seventh on a Perivolaris two-run single to left. In the top of the ninth, however, Degifico and Troiano each singled, Quintal was hit by a pitch, and Andrew Hillier hit a game-tying two-out double. Quintal, however, was thrown out at third on the play and, following an intentional walk, Cortland got out of the jam with a strikeout and flyout. The Red Dragons had runners on first and second with one out in the bottom of the ninth before a double play ended the inning. Quintal’s two-run triple with two outs in the top of the 10th drove in Heath and Kaleb Bridgham, who each singled with one out and moved up on a groundout. Cortland had runners on first and third in the bottom of the 10th, but a groundout ended the game. The teams combined for 35 hits – 18 by Cortland and 17 by Southern Maine. Tardif was 4-for-5 with a walk, Perivolaris finished 3-for-5 with a walk, four RBI and two runs, and Personius and Pragana each went 3-for-6. Quintal was 3-for-6 with a hit by pitch and three RBI and Troiano went 3-for-5 with a walk, two RBI and two runs for Southern Maine. Each team’s starting pitcher lasted only a third of an inning. Andrew Barnes (Rochester, NH/Spaulding) was relieved by Frank Vesuvio (Armonk/Byram Hills) after Barnes allowed three runs, two earned, on three hits. Vesuvio tossed three and two thirds innings of scoreless ball with three hits, two walks and one strikeout. Steven Salisbury (Cranston, RI/Moses Brown) gave up five unearned runs on four hits in three innings. Mike Harrington (Glens Falls), who started on the first day of the regional, entered in relief in the eighth and took the loss after giving up four runs on seven hits. Southern Maine starter James Sinclair gave up four runs, two earned, before giving way to Colton Lawrence, who allowed one run on four hits in two and a third innings. Jake Dexter earned the win in relief after giving up one run on five hits with one walk in three and two thirds innings.